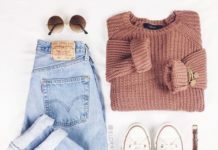 Choosing the perfect outfit for brunch can depend on so many things from the place to the weather and your personal style – and if you are not exactly sure what to wear, keep reading for our 30 brunch outfit ideas to find the ideal one for you! This bright look is perfect for a summer brunch! 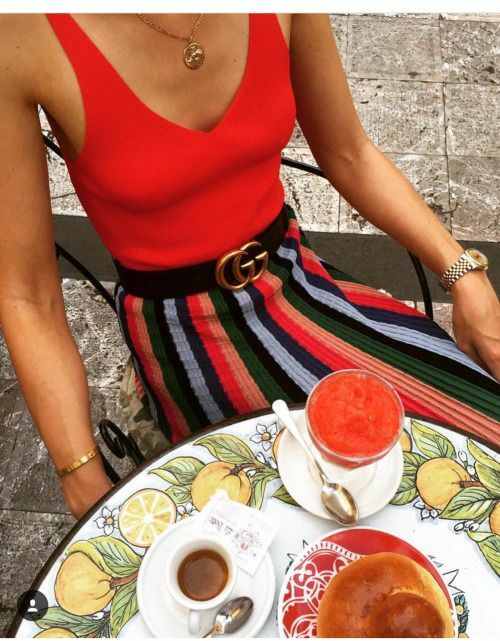 With the low cut cotton top and the pleated, striped palazzo pants, it has a boho, vintage vibe to it, especially with the bright red, baby blue, green and black color combination. This pastel wrap dress with the low front cut and adorable silver and gold stars is perfect for a first date or afternoon brunch with your friends. Another thing we love about this outfit is the styling: the statement earrings make the metallic stars on the dress pop even more. One of this summer’s hottest combinations: white lace and classic, blue denim. Besides it’s casual and comfortable (especially with the oversized silhouette of this dress), it is also a cute and girly outfit with a unique edge to it. If you want something extra, choose a crystal embellished denim jacket or a white and neon lace dress. 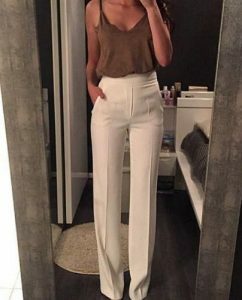 Palazzo pants are definitely risky clothing items and it takes courage to wear them, but paired with the right top, they look 100% flawless. 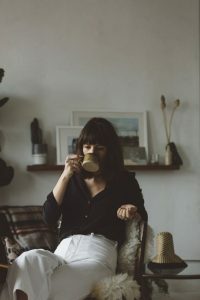 We love how the oversized satin top makes these pants look a bit more relaxed and casual, and you can easily play with different styles by adding flats or heels. Brunch is the perfect occasion to pull out the more playful items from your closet, especially for an outdoors summer brunch with your family. 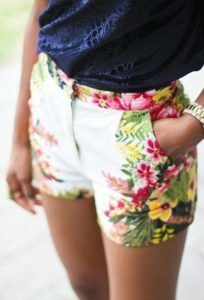 These shorts are simply adorable with the white, pink and green color combination and the floral pattern, especially matched with this dark blue T-shirt. Pink and white is always a great choice, but with this striped co-ord set, it won us over even more. Both the silhouette and the design of the T-shirt and skirt is perfection, and because of the fun colors, this set is not too formal at all. 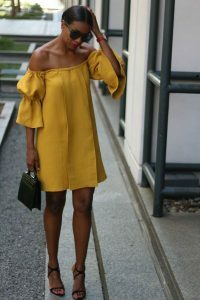 Off shoulders have been a huge trend this spring and summer, and mixed with the puffy sleeves and the daring mustard yellow, this outfit has just the right amount of craziness to it. Match it with oversized sunglasses and lace up heels or pom pom gladiator sandals. You can turn any oversized T-shirt (even your boyfriend’s T-shirt) into a cute look for brunch with boho accessories! Vamp it up with gladiator sandals, a statement necklace and a pair of ripped shorts. To keep the theme going, create messy braids and you are good to go! 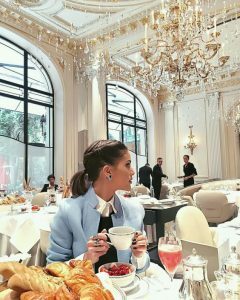 If you are invited to a fancy brunch where you want to show off your style while still being appropriate and super elegant, we recommend rocking a pastel blazer or wool jacket with a collared shirt and pearl accessories. Pale yellow and oversized, ruffle designs are just perfection for a hot summer day! We love everything about this look from the silhouette to the unique color of the dress, and if you want to vamp up this look, simply add a jeweled clutch and statement earrings to the outfit. Cute dungarees with a simple white T-shirt ad dark mauve lipstick is a great brunch go-to. It’s playful and casual with a girly edge to it. Besides being perfect for brunch, we would basically rock this dress anywhere: dates, holidays, parties, family events and to any other occasion. Because of its length and pretty pattern, it is definitely elegant, but the cut outs and the sleeveless design makes just a tiny bit sultry. What’s better than a regular wrap dress? A gorgeous maxi wrap dress! 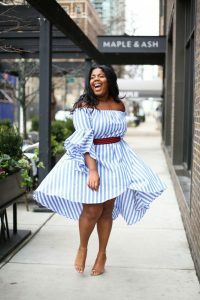 Because of its silhouette and light fabric, we can imagine this dress effortlessly flowing in the wind, and we want this in our closet immediately! White sheer dresses, kimonos and rompers with neutral accessories… a timeless holiday classic. This beach cover up dress with the sunhat and the tan bag and shoes is a great look for a beach brunch! If you want to keep things really comfy, we recommend choosing a monochrome T-shirt dress paired with oxford shoes or lace-up gladiator sandals! We also love how this outfit features an embellished, colorful bag, which makes the outfit more exciting. From the mint base to the peter pan collar, the huge red roses, and the A-line midi design, this dress is such a classic piece! 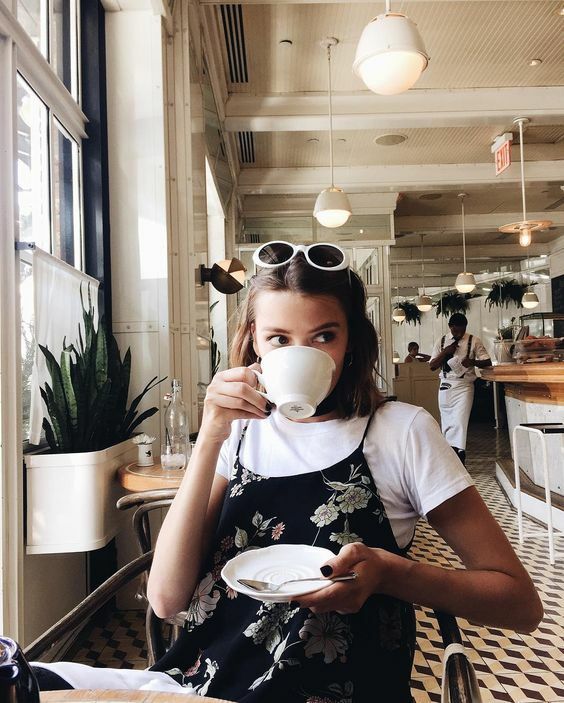 We would pair it with red lips, black heels and a little hat, and it’s the perfect outfit for a fancy brunch. 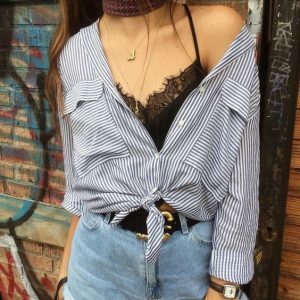 Although it might be a surprising combination, stripes and lace can work really well together, whether you decide to layer them underneath each other or use them as a skirt and shirt combination. If you go with natural tones, such as black, gray and white, a red lipstick will make the outfit pop even more. This outfit mixes casual and fancy elements so beautifully together! The golden, metallic pleated midi skirt might be risky to pull off, especially during the daytime, but with a soft, silky cashmere sweater or a simple white T-shirt, it can work well for a brunch. If you want something very effortless that shows just the right amount of skin, go with a beautiful, backless tops and a pair of denim or high waisted shorts! While it is a bit more formal and serious color combination, we are in love with classic black and white outfits! 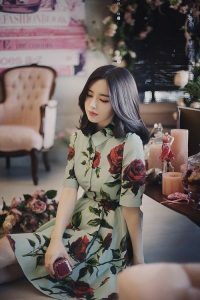 Besides being very traditional and monochrome, these looks are also great if you want to have a crazy manicure or makeup, as they keep your overall look subtle and elegant. If you want to get creative with your look, grab a shirt and create an off-shoulder, relaxed top by unbuttoning and folding the top half! 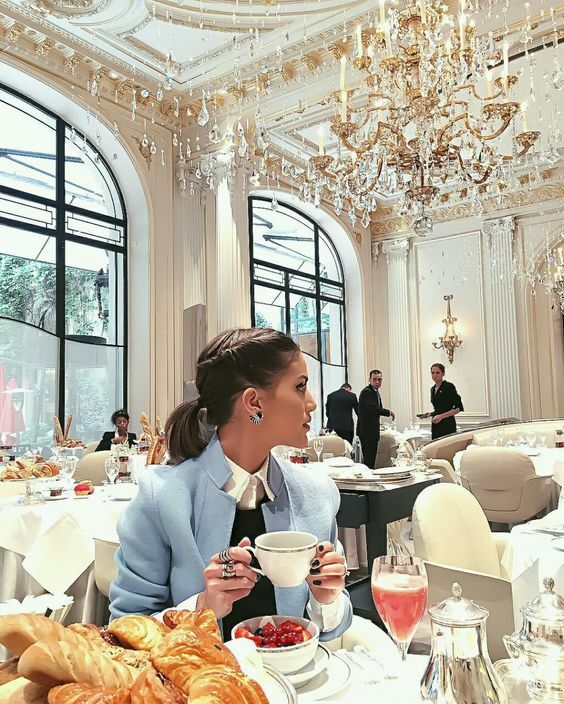 This is exactly how we would imagine our fancy dream-brunch outfit at the Ritz in London! Beautiful, slicked back hair, a pair of statement earrings, a ruffled white silk blouse and a figure hugging, black pencil skirt, creating a gorgeous, formal outfit. After two monochrome, black and white looks, it was time to feature something a bit more fun and colorful, and this all-blue outfit stole our hearts right away. The button up denim mini skirt looks stunning with the oversized blue T-shirt, not to mention the accessories! If you have a gorgeous silk dress, but would like to go with something more casual for brunch, get experimental and match it with a white, beige or dusty pink T-shirt underneath it. This trend is very vintage and 90’s inspired, so it’s just the right amount of fun and crazy. Let’s be honest: who could ever say no to a beautiful, striped off shoulder dress like this? Besides the silhouette, the length and the stripes of the dress, we also love the pop of red and black on the dress, as well as the mix of the two different striped designs. Rock it with curly locks, a pair of black heels and a deep, matte red lipstick! Feeling cute and boho chic? This white, low cut lace romper with the adorable buns and the reflective sunglasses is perfect for a summer holiday brunch. Another great styling idea for a dress or romper like this is to keep the accessories minimal, just like this look does with the stacked, thin moon and gold necklaces. An all-black outfit can be instantly more friendly and fun with a pop of color, and this jacket is to die for! 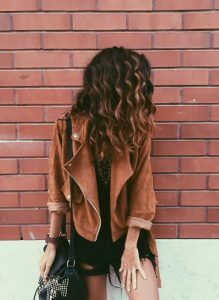 Its copper color, its edgy cut, and its luxurious suede material complements the lace-up black top and ripped black shorts beautifully. Another “fancy brunch” outfit idea is to choose a simple satin blouse with a printed peplum skirt, and to make it most fashion forward, don’t be afraid to play with the accessories! A leopard print or embellished clutch, an embroidered pair of boots, a pop of coral orange on your lips – anything can make an elegant shirt and pencil skirt outfit fun and youthful. 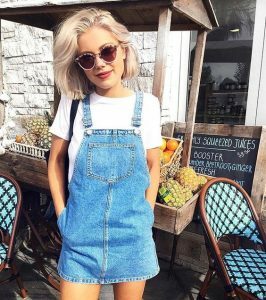 If you are starting to get bored with a simple pair of jeans or shorts, it’s time to switch things up a bit and search for a denim top! 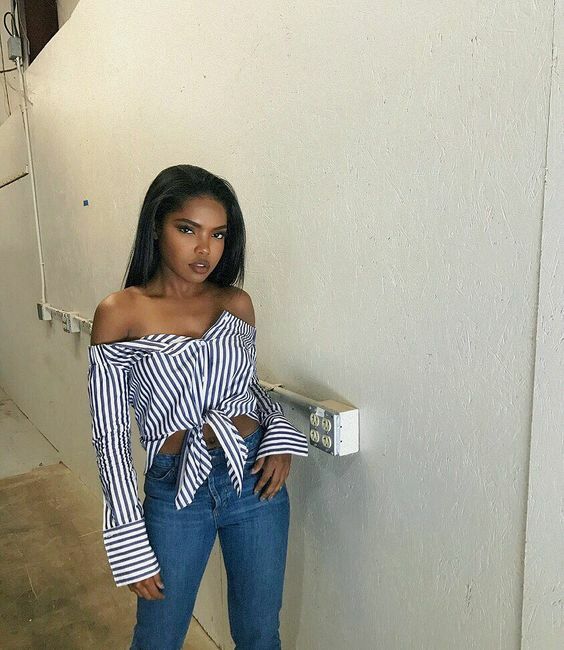 This outfit speaks for itself with the beautiful, oversized bow detailing on the front and the combination of denim and white colors. As these are very neutral shades, find an electric blue or red bag or colorful sandals to create a more interesting overall look.